“Adopted and raised by loving parents, David Corbin had no idea his life as he knew it was a lie. Then he met a girl. Abby Brown freed David from the spell keeping him from the truth, that he was the lost heir to the throne in a magical realm. After escaping the clutches of the woman who kidnapped him, fleeing an army of blood-thirsty monsters, and winning Abby's heart, David returned to claim his crown as Solas Beir, king of Cai Terenmare. Even though he got the girl and gained a kingdom, David had no clue about the unfathomable power he would inherit, nor did he realize how much he would have to sacrifice to keep the throne. Tynan Tierney, the man who ordered the assassination of David's father, has been freed from his wasteland prison by Lucia, the very woman who abducted David. Together, they plot to usurp the new king, once again gathering Tierney's dark disciples. If there is any hope of winning the war against his Kruorumbrae, the deadly Blood Shadows, David, Abby, and their friends will have to journey to the outer edges of the realm to secure the loyalty of the four Oracles. I really loved the cover of The Sign of the Throne, but I think I might like this cover even more. I love the green and how it just fits perfectly with the cover of book one! Out of the shadows of the labyrinth, a massive beast emerged. He was bigger than Calder had been, but while Calder had been a hairless, muscled brute, this feline creature was lean, muscled in a way that was beautiful and terrible at the same time. He had the look of a sophisticated and efficient killer—covered in thick, shiny fur with black-on-black stripes. He approached Abby with a menacing deliberateness, bearing long, primeval fangs. The creature stared back, eyeing Abby’s clenched jaw and defensive stance, and then he smiled apologetically. “Oh, I’m so sorry,” Tierney said. “I forget this face can be, shall we say, rather off-putting. Allow me to present a more pleasing visage.” His form changed, melting away like smoke, leaving black ashes lingering in the air. In the creature’s place stood a handsome young man with dark eyes—nothing like the beast he had just been. To her surprise, Tierney started laughing—not a mean, condescending laugh, but one of genuine, unguarded amusement. It wasn’t quite the response Abby had expected. “I assume it’s to get to the Solas Beir by killing me,” Abby said. “Oh, come now, Rabbit, I’m hurt. I have absolutely no such plans. None at all,” Tierney replied. “I have trouble believing that—your reputation precedes you,” she said. Abby noticed that Tierney used the term “Lightbearer” rather than David’s formal title of Solas Beir. She didn’t think it was an accident. In fact, she was certain that Tynan Tierney never said or did anything that wasn’t calculated. “What is it you want, exactly?” she demanded, putting her hands on her hips. “Only to see if the story was true. I can see now that you’ve been underestimated. Clearly, you are no ordinary human girl. You are turning out to be much more interesting than I thought you would be, pretty little c’aislingaer,” he said. He was so warm, and his touch made her skin tingle, much to her chagrin. She fought to show no response, reminding herself to keep her guard up. He continued, his lips almost grazing her skin as he talked. “What I want, Abigail, is to show you the truth—to help you see my side of the story so you can decide for yourself if my so-called reputation is deserved.” He pulled away suddenly, his head cocked to one side as if he had heard something. Tierney turned back, his dark eyes on her. “Your boyfriend is coming. Better not let him see you fraternizing with the enemy. Until we meet again, little Rabbit.” Taking her hand, he held it to his lips, kissing it with a disarming tenderness. Then he was gone—not in some magic puff of smoke, but simply not there anymore. Abby heard the crack of a twig breaking as someone approached. Rather than feeling a sense of relief, she felt oddly guilty, like she had been caught in the act of doing something wrong. She had just survived what should have been a lethal encounter with a monster, but instead of being frightened of Tierney, she found herself attracted to him. And that terrified her. Melissa Eskue Ousley lives in the Pacific Northwest of the United States with her family and their Kelpie, Gryphon. 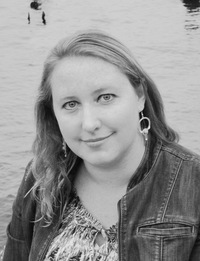 When she’s not writing, Melissa can be found hiking, swimming, scuba diving, kayaking, or walking along the beach, poking dead things with a stick. 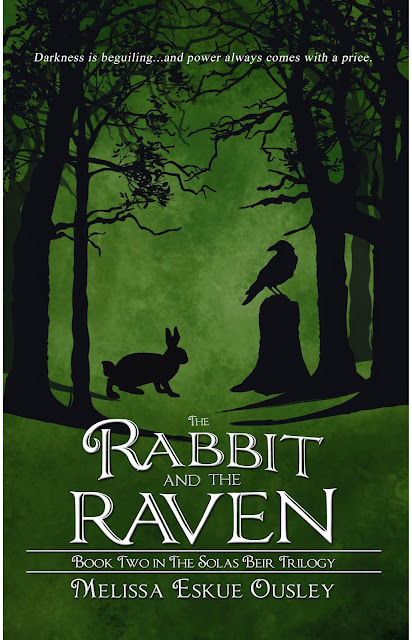 For more about The Rabbit and the Raven add it on Goodreads! For more about the first book in the series, Sign of the Throne, check out these sites! I am liking these covers, they are mysterious and make you curious about that is going on inside :) Thank you for sharing with us. Thanks so much for hosting me, Jesse! I appreciate it. The PNW is beautiful! Thanks Brenda, Denise, Ella, and Magicamagi for your kind thoughts. Beautiful cover. Just like the first! Sign of The Throne was fantastic!! I can't wait for The Rabbit and The Raven. Thank you SO much for this wonderful opportunity!